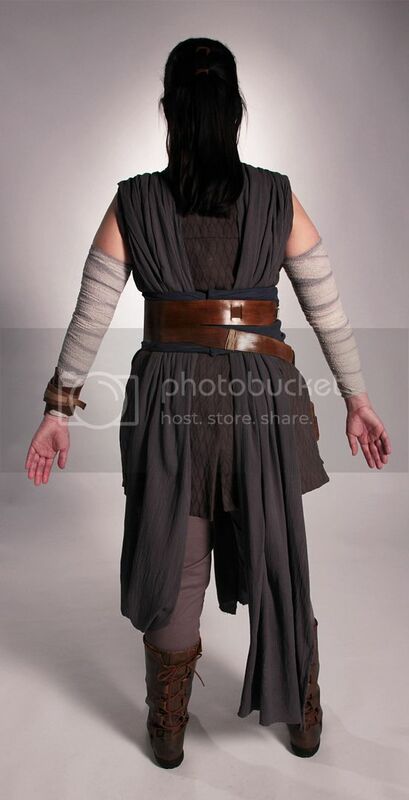 Last spring I made a Hero Rey costume! I wore it to Kansas City Royals Star Wars day on May 4th. 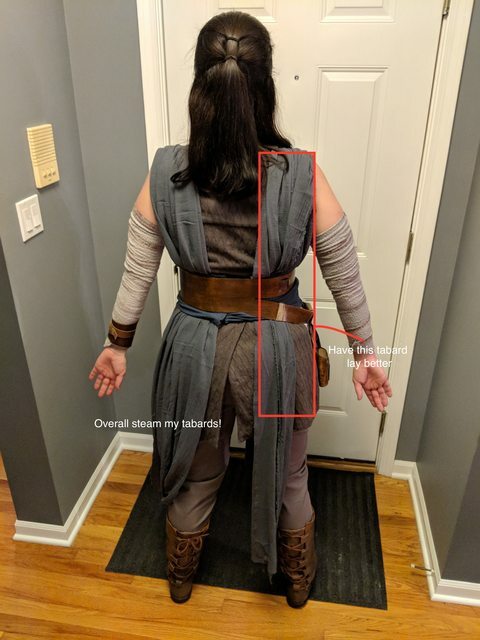 I was a little hesitant on trying for Rebel Legion approval but I realized after wearing the costume for Halloween that I love being Rey and I would love to start trooping. This was my first experience making a Cosplay costume. 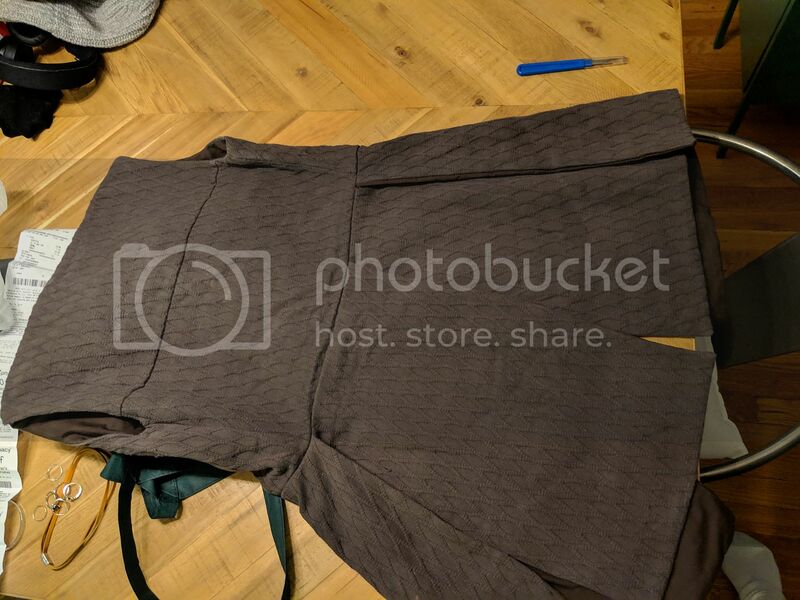 I have dabbled in the past with Halloween costumes in the past but lurking in the forums while making this costume I realized that this is an entire new world! Ripped out the side seams and got to work on adding the knee seams back seams etc. etc. 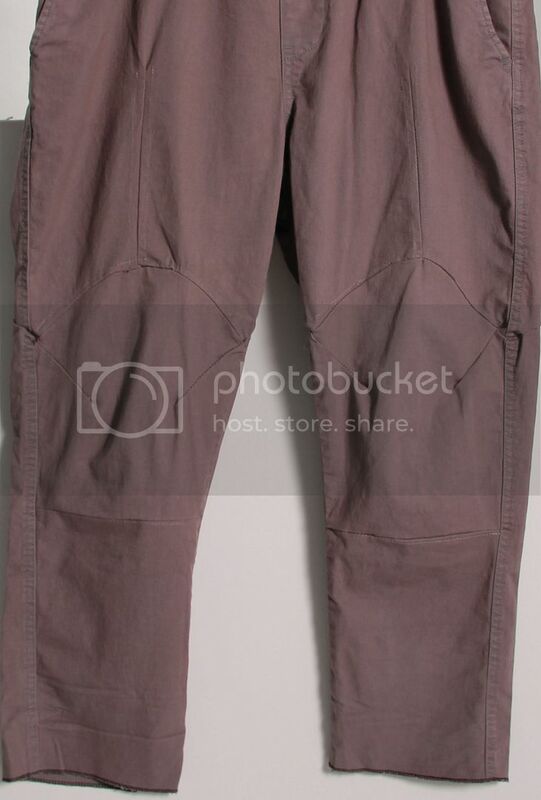 Later, I would add side seams to the center front seam - after seeing a suggestion on the forum to do that! 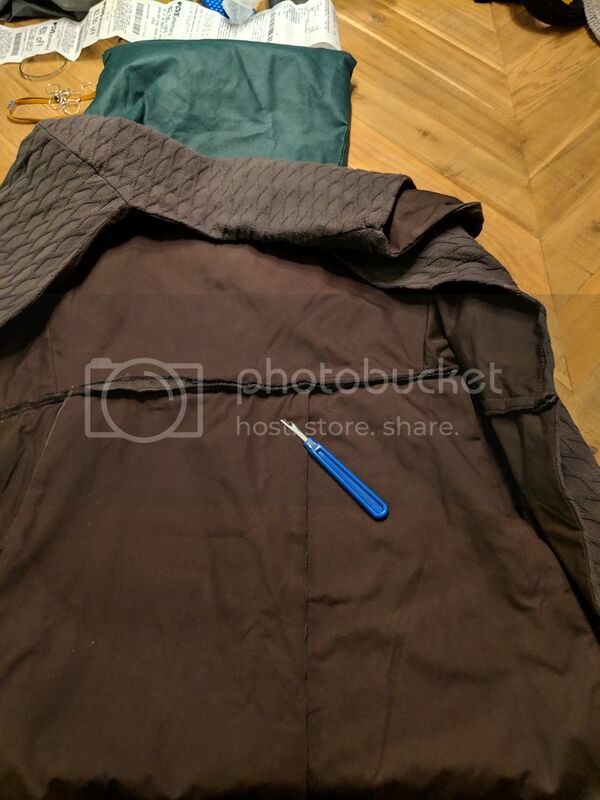 Seems like my photos aren't embedding properly! It's true the photos aren't embedding properly, but the links work if copied and pasted. Looks like you are off to a good start! PS: Welcome to the Rey Sisterhood! Thank you Wabbit89! Excited to be posting after being a lurker for so long! Lets see if I can properly embed now... If not I'll make the images clickable links! 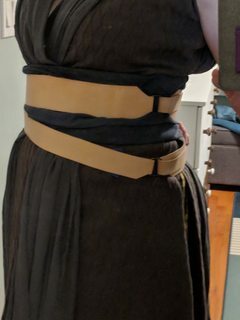 Okay the best (worst) part of making Hero Rey - Finding the closest vest material and dyeingggg! 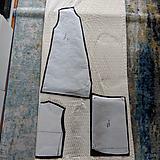 Then it was on to the real fabric for the vest. 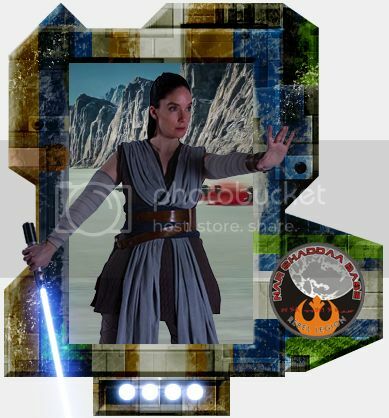 I couldn't get my hands on the real fabric from Mode Fabrics (some Lucky Rey's out there did!) So I followed some of the ladies on here and got the Blanket from Amazon to dye. 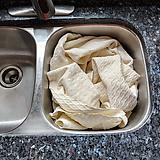 I cut the lining fabric (brown cotton broadcloth from Joann's) and used that to cut the blanket down so it could fit in my sink. 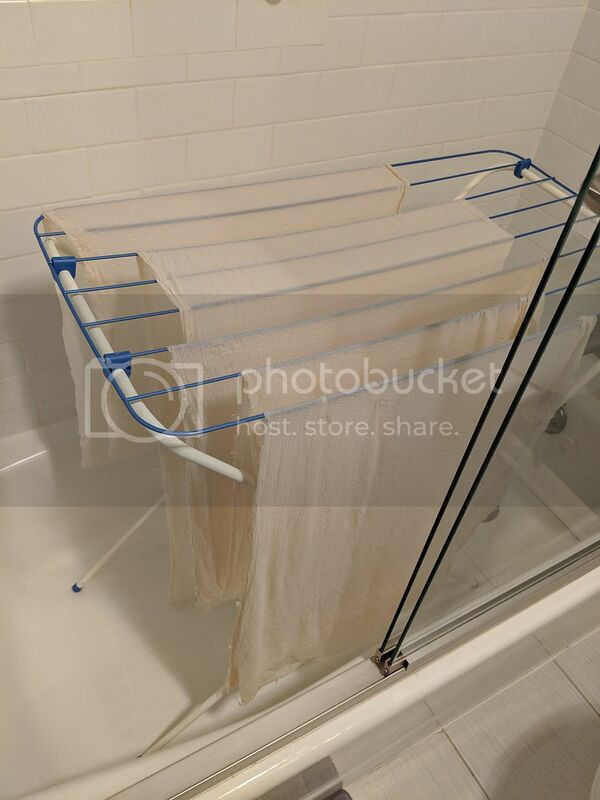 At this point in the process my husband started to think I was crazy! I was pretty pleased with the result. 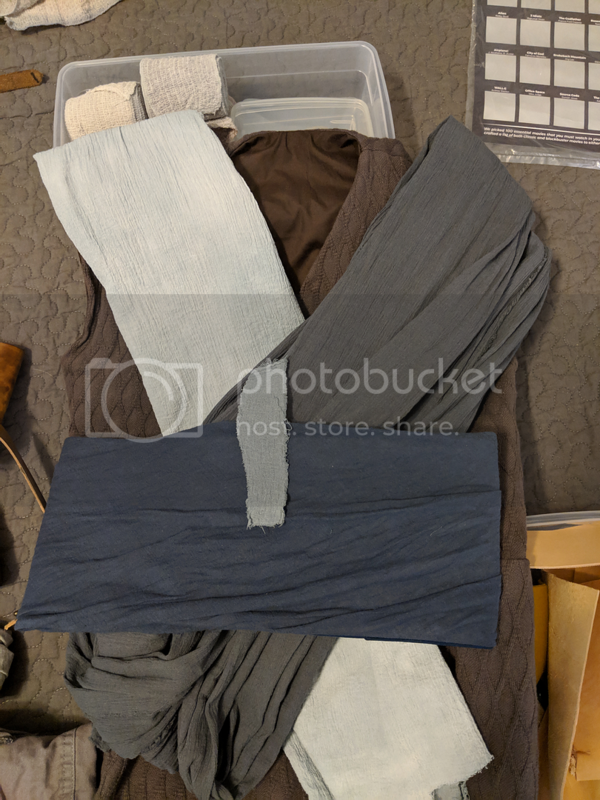 I had some uneven dye on some parts of the blanket but I tried to place these pieces either as the under part in the wrap of the vest or have it be in a place covered by the tabards. Then I went on to dye the tabards. I knew I wasn't going to be able to dye the 6 feet (maybe six feet? long a** tabards!) so I cut and pieced them together strategically placing the seams where it would lay under the obi. My first run of dyeing the tabards was fine but I wasn't completely happy with the results so I went to Joann's and bought another round of fabric. 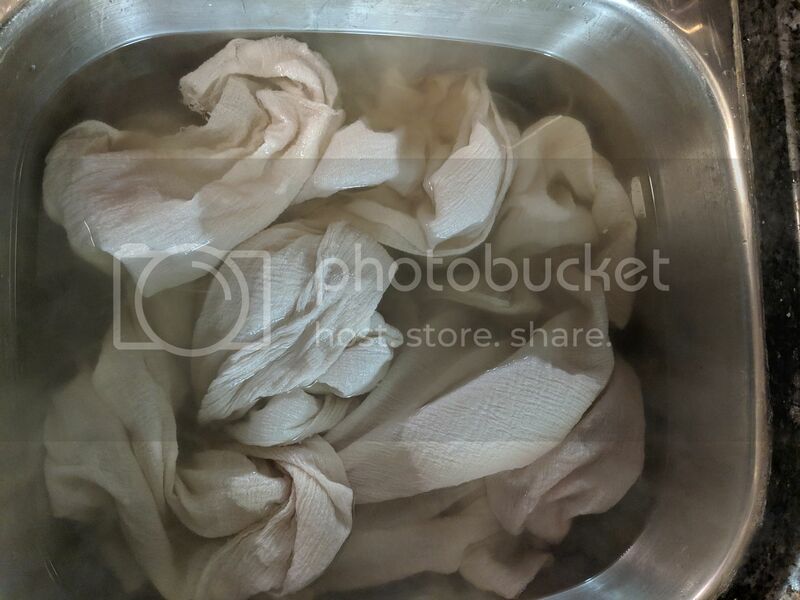 I dyed that fabric and it turned out HORRENDOUS (splotchy and too light) So I was like the first round will do!!! 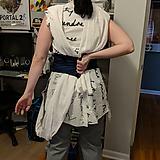 Those side seams are a bit tricky and I have a small waist big bum so the back flaps were a test as well. 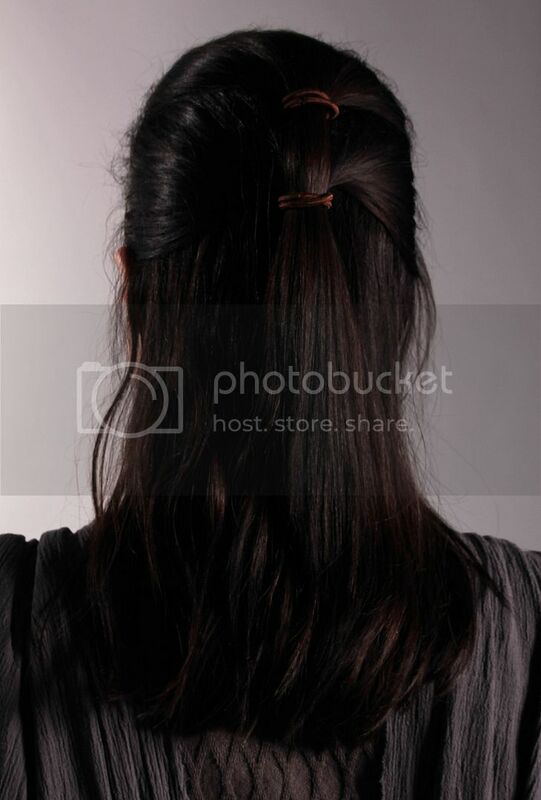 (okay so I hit about 50/50 on being able to embed or link my dang photos) I honestly will get the hang of this someday! So at a certain point I made the shirt - I don't really remember doing that honestly. 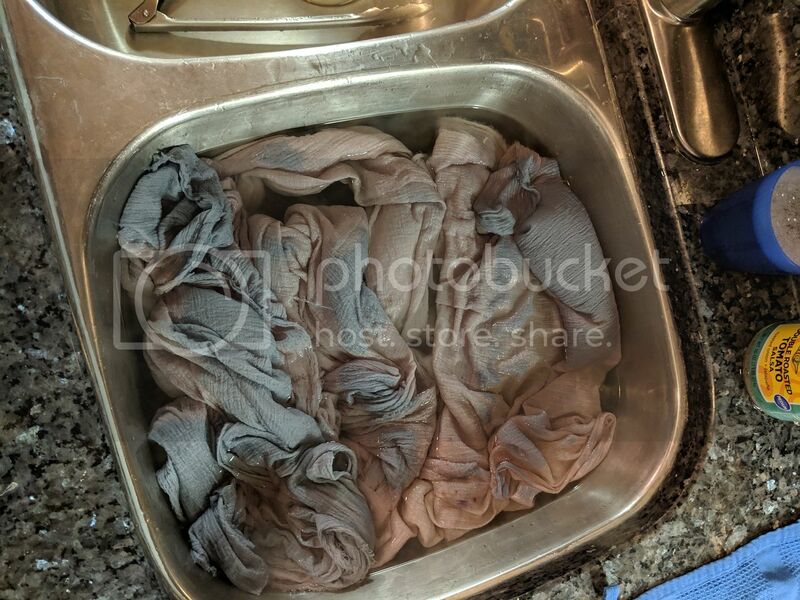 I do remember dunking the bright white shirt I used for undershirt into the brown dye leftovers after dyeing my vest to age it a bit. 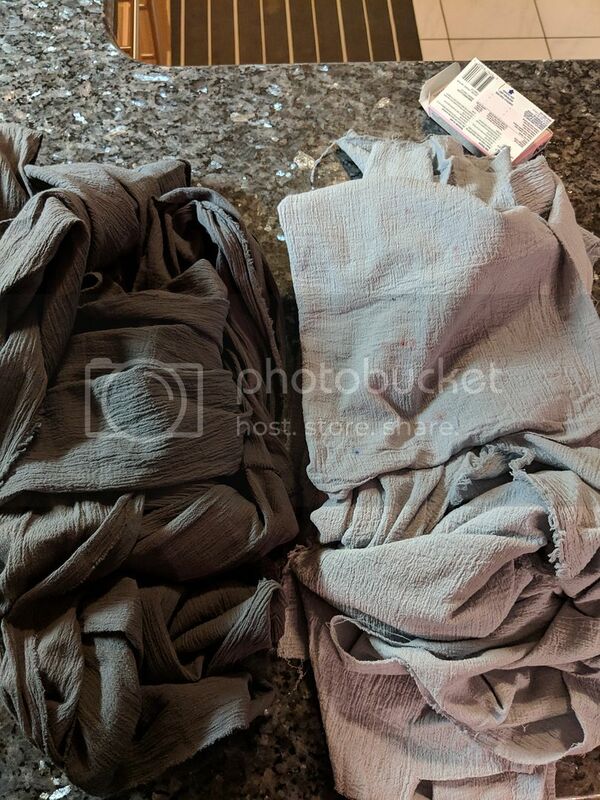 I also dunked my arm wrap gauze into the grey dye I used for the tabards. 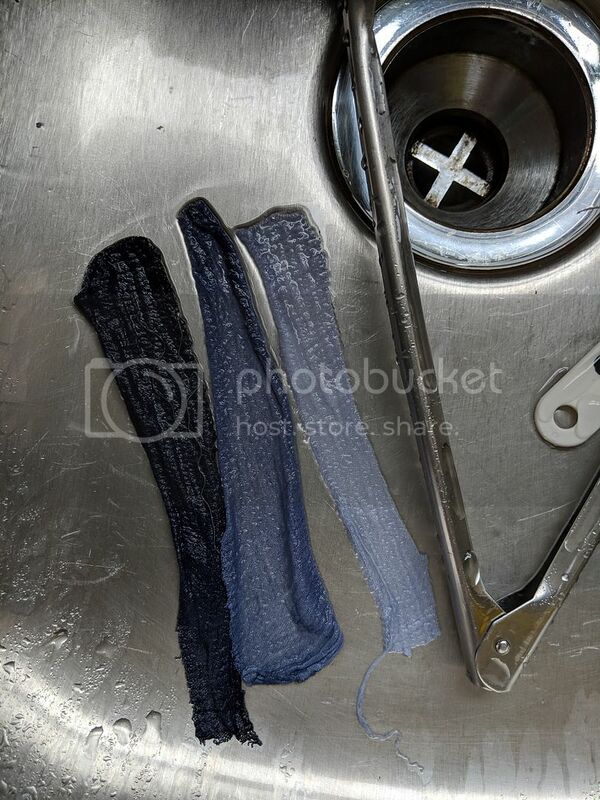 Once those were dry I rolled them up and dipped the edges into the blue dye I used for my obi. I dipped them super quickly like a dunk on the edges then quickly rinse. 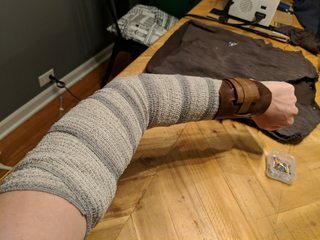 I bought the amazon gauze arm wraps that have been floating around here as a substitute for the Boots arm wraps that everyone likes. I originally thought I could used the extra leather for the wrist bracer but that leather was wayyy too thick. 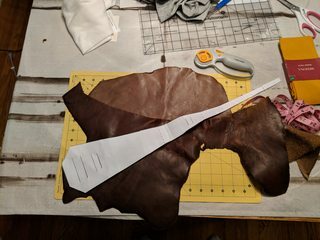 Thankfully my local Michaels had a bag of leftover leather scraps that I bought and it had the two contrasting colors in a thinner leather. Making the bracer, its a good idea to have your arm wraps on hand to test fit. 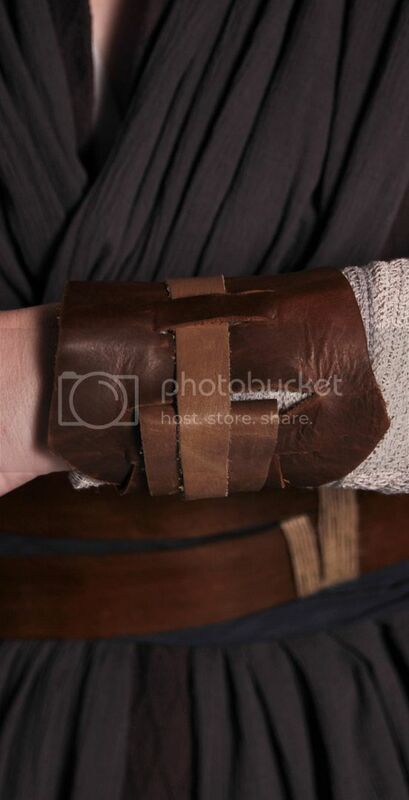 The bracer on my bare wrist doesn't fit but its nice and snug over the arm wrap gauze. 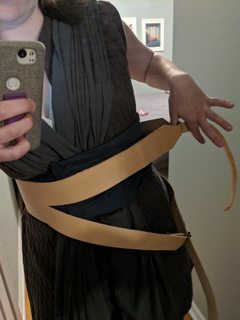 Having the arm wraps with the bracer is honestly the coolest part (at least for me) making the battle Rey. I felt awesome just wearing her arm wraps and bracer. 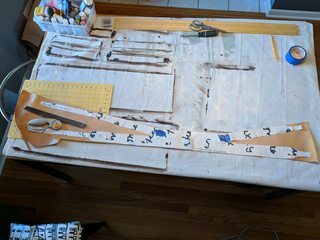 After this I cut it down to make sure it fit me correctly over all the vest, tabards, and obi! After I went to Star Wars Night at the Royals I decided to make the blaster holder. 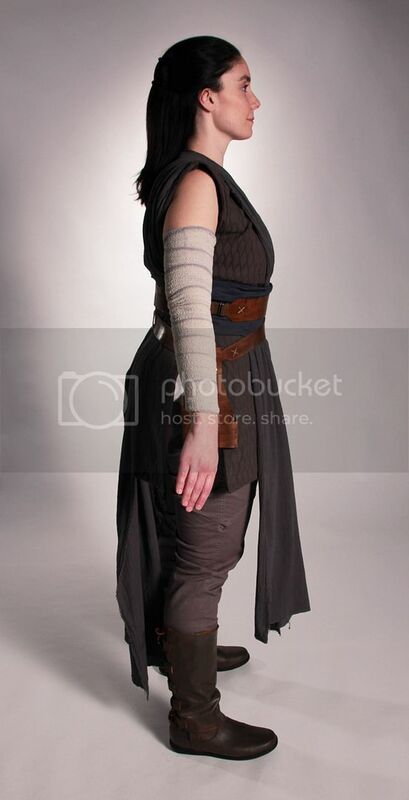 This weekend I think I am going to attempt to retake my photos to get my Rey approved. Since I will be under 1 million feet of snow! Some things I will be aware of when I retake these photos - Make sure it is well lit and find a better neutral background - I wish I had some white sheets that I could hang... Also not have my tall husband take the photos! Okay thanks for following along on my random not terribly well documented travel to Hero Rey! I also used a blanket and dyed it. I am nearly certain I did "carafe," too. One, have someone else (who knows how they're supposed to go) adjust the tabards after you're dressed. They're super stupid and won't lay right no matter what until someone else fixes them. Two, for a background for pics, if you have one and aren't buried under a million feet of snow, going outside to your driveway and standing in front of your garage door works great. The natural sunlight is so much better for colors than anything inside, and it's (generally) a solid color. 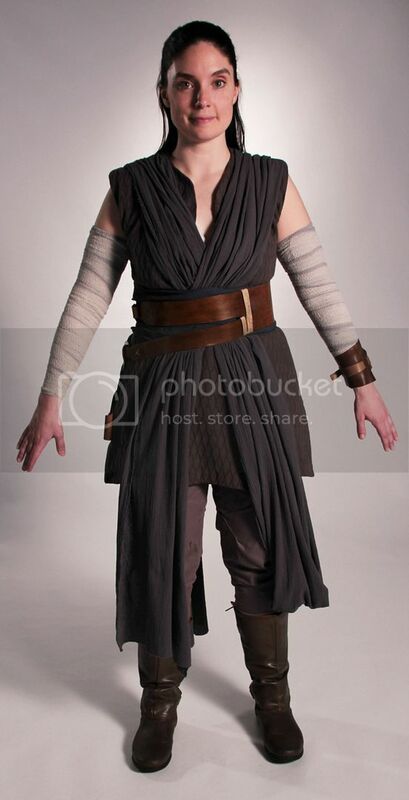 I took Rey inside, I think, because it was at night when I got help, but in general, that's what I've been doing for my costume pics. It helps a ton. 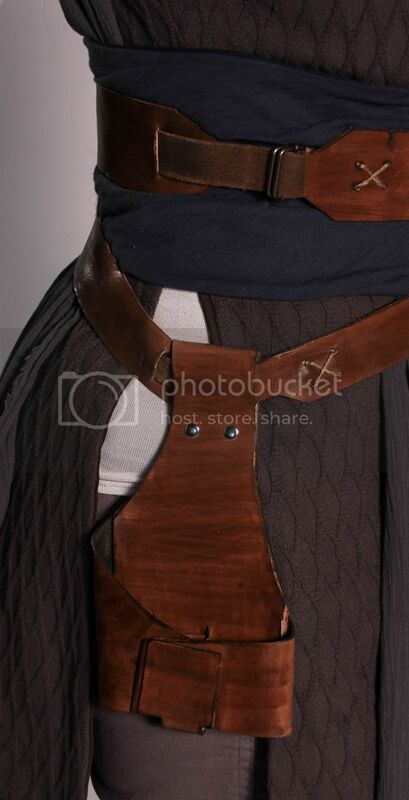 PS: I have made the bracer, belt, and holster for others. If you need help/they ask for tweaks, let me know and I'll help if I can. PS: I think your tabards are fine a bit wrinkly. 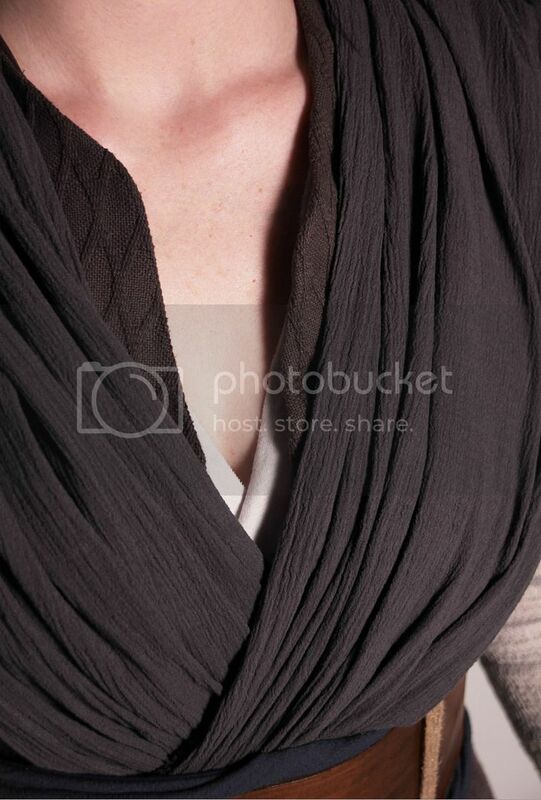 I agree your undershirt needs to be longer/peek out some at your hips. 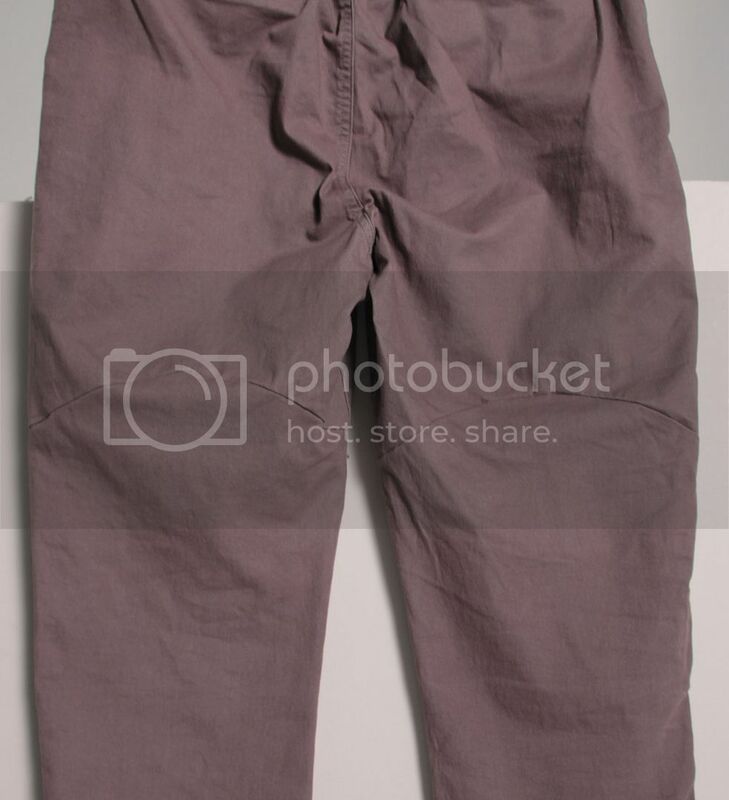 And I DM'd you about your belt. 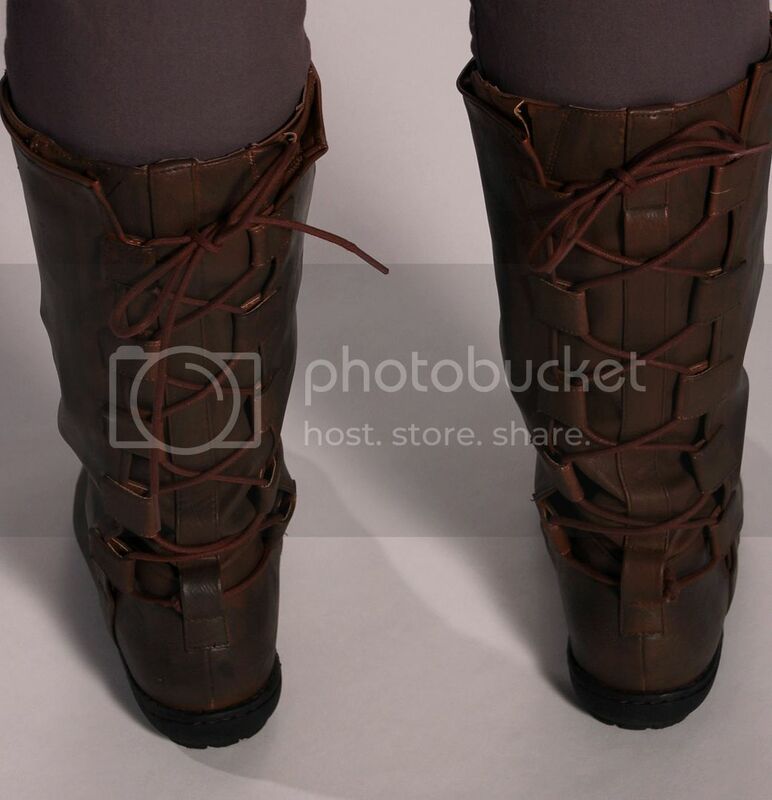 Also, you did an AMAZING job on those boots. 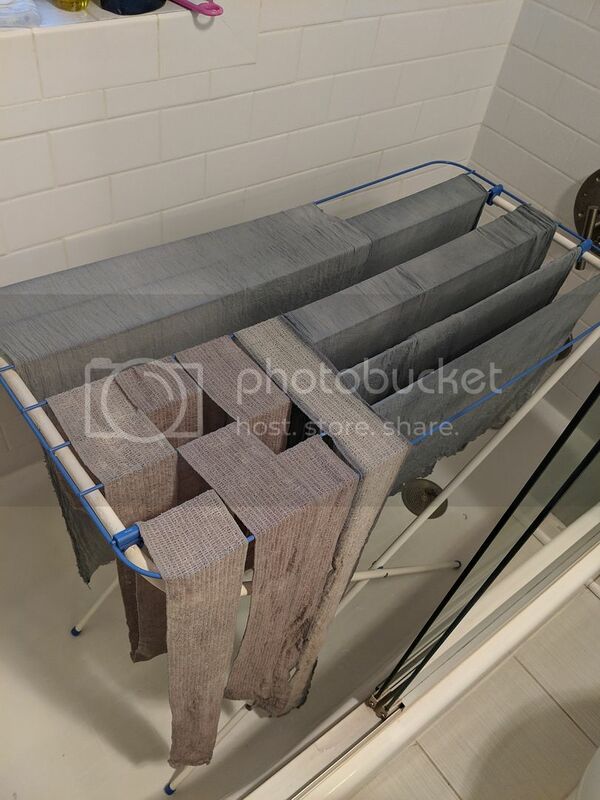 Posted: Tue Feb 26, 2019 4:25 am Post subject: Accidentally Hit ENTER while uploading my photos! I hit ENTER (like a dummy) while working on my costume registration! I had 2 of my 11 photos uploaded I was in the process of uploading all my detailed photos oh man its like someone above doesn't want me to apply for approval! I am in Illinois so I am applying for Nar Shaddaa Base. 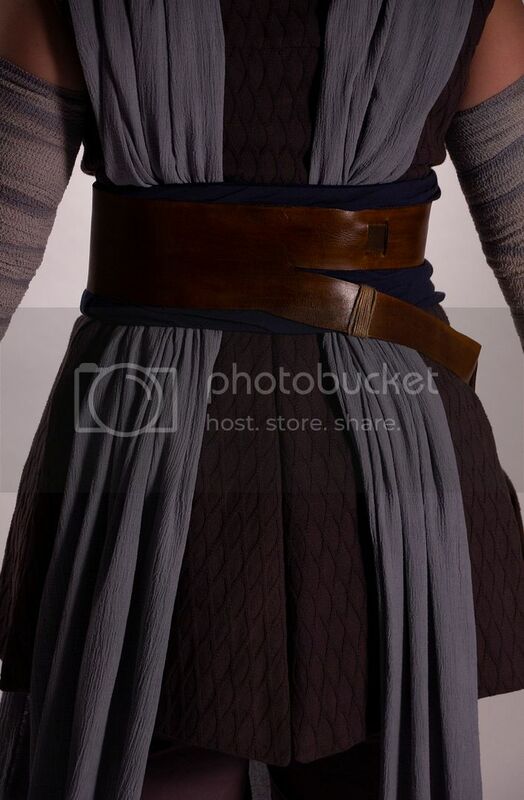 Any help from the fellow Reys out there?... thank you in advance!!! It'll be ok. Your judge will email you and you can send them more photos that way. At least I'd expect that's what would happen in this case, as they always email you when you don't get approved to tell you why and sometimes they just ask for more pics anyway. 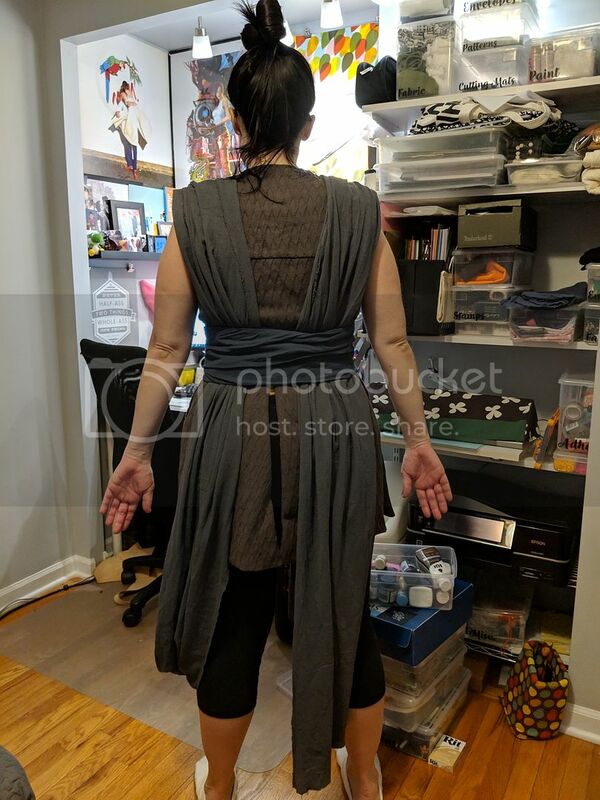 My judge emailed me with two things to fix - My tabards were too dark and my vest back panels overlapped (visibly). SO BACK to the DYE-ING BOARD! sorry that was bad pun! Test strips! So from right to left its 10 seconds 1 minute and 5 minutes - honestly the fabric SUCKED up that dye dang! 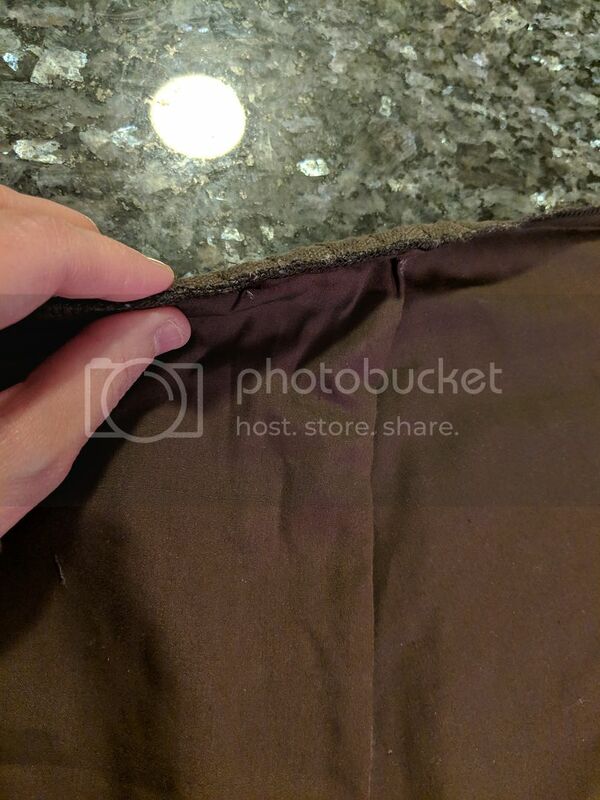 On to the tunic fixes! So here is my redone tabards compared with my old tabards - the judge also said when I resubmitted that I should re-make my obi and I completely agree - will probably remake my obi with the old tabard fabric - since the real (well reproduced) vest fabric is back I will most likely remake my vest with that fabric too! Next post will have my resubmitted photos and a happy outcome! Posted: Wed Apr 17, 2019 8:06 pm Post subject: I got approved! YAY! Here are the photos I used to resubmit! 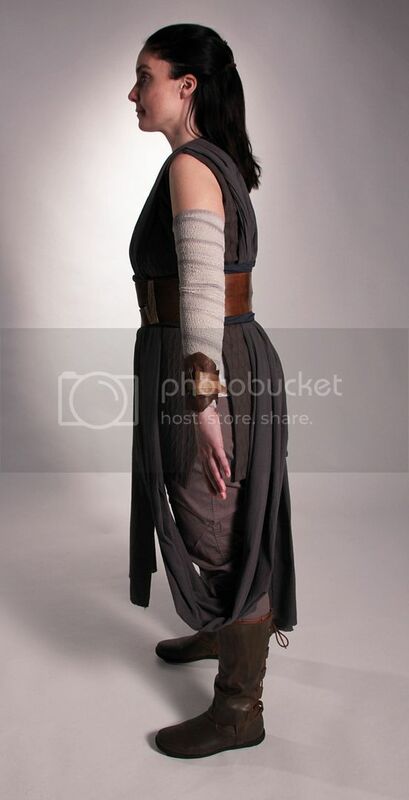 Now I want to do another REY or PADME or LEIA oh man I'm addicted! thanks for following along and good luck with your HERO REY!